Powers/Abilities: Dr. MacLain is a gifted metallurgist whose inventions have included Captain America's shield and adamantium. He had also proven adept at robotics and constructing suits of armor. (Astonishing Tales: Dominic Fortune#1 (fb) - BTS) - Myron fathered two daughters, Amanda and Andrea. They both grew estranged from their father after their mother's death because he cut them off without a cent. (Astonishing Tales: Dominic Fortune#2 (fb) - BTS) - Myron worked for Howard Stark at Stark Industries as their top mettalurgist. (Astonishing Tales: Dominic Fortune#2 (fb) - BTS) - ...her globe-trotting sister Andrea got involved in the mineral business. Eventually her father suggested to Howard to hire Andrea because her vast connections all over the world would be an aid in acquiring the rare metals he required for research. While she was in negotiations for some contracts Andrea got killed (it was one of Stark's partners as revealed in #6...he remained unidentified AFAIK and did it because he feared the wrath of the Brits and Nazis in case they found out that Stark Industries were not able to acquire the rare metal they promised both parties). (Astonishing Tales: Dominic Fortune#2) - Dominic Fortune and Andrea's sister Amanda investigated her death and overheard Myron MacLain at the Hephaestus weapons foundry talking to Baron Zemo on the phone. Myron appreaciated Zemo's condolences, but told Zemo he couldn't continue his daughter's expedition without angering Stark Industries' British customers and due to the US' neutrality could only put Zemo in touch with Amanda's sources. Myron was given plans for new castings to look at. After Myron and everyone else had left Dominic stole Myron's documents on the rare metal and Stark's dealings with the Brits and Nazis. (Astonishing Tales: Dominic Fortune#5) - Myron told Howard that he was sure Andrea was on the trail of another source of the rare metal before she got killed. Assuming Fortune and Amanda could possibly find the second source Howard asked Myron if he could convince Amanda to work with them. Myron was sure he could because this was the sole reason they let Fortune steal their files. (Astonishing Tales: Dominic Fortune#6 - BTS) - Amanda was arrested after she shot her sister's murderer in public. (Captain America I#303 (fb)) - During World War II, Myron MacLain was employed by the American government as a metallurgist to create a super-strong metal which could be used in constructing tanks. MacLain was granted a sample of vibranium to work with, and dozed off one night while waiting for the metal to heat up. When he awoke, he found that the metals had attained the level of bonding he had been striving for. He quickly poured the metal into a disc form to serve as a tank hatch, but was unable to determine what had occurred to affect the metal's bonding. The disc was later presented to Captain America to serve as his shield. (Wolverine II#-1) - While working at the Department of Agriculture in Washington, MacLain was visited by Logan, an amnesiac mutant who had been granted an unbreakable skeleton and claws. Although he had been warned not to speak with Logan, MacLain agreed to examine him. MacLain could not account for where the metal had come from, but suggested Lord Darkwind, a Japanese scientist said to have created an unbreakable metal during World War II. Before he could say more, Logan was taken away by Victor Creed. (Conspiracy#2 (fb) - BTS) - Dr. MacLain was granted funding in his efforts to recreate the mystery metal of Cap's shield by the government agency Control. (Avengers I#66) - After spending years attempting to recreate the mystery metal, MacLain was employed by S.H.I.E.L.D., and created the metal adamantium, which was nearly as indestructible as Captain America's shield. The Avengers came to the S.H.I.E.L.D. Helicarrier to witness a test of the metal, and Thor, Iron Man and Goliath each tried to break the metal, to no avail. MacLain revealed that only the molecular rearranger could reshape adamantium, but while he was proud that his new metal had held up, he feared what might happen should it fall into the wrong hands. His fears were proven to be well-founded when Ultron forced the Vision to steal a cylinder of adamantium for use in the reconstruction of his body into Ultron-6. (Avengers I#68) - Dr. MacLain contacted the Avengers to warn them that the molecular rearranger had been stolen from him during their battle with Ultron-6. The Avengers ultimately thwarted Ultron by having Yellowjacket hypnotized into believing he was MacLain so that when Ultron attempted to abduct him and drain his mind he would be overcome by the words "thou shalt not kill," repeated over and over again. (Captain America I#304 (fb) - BTS) - Dr. MacLain later retired from S.H.I.E.L.D., and became something of a hermit, hidden away from the world. 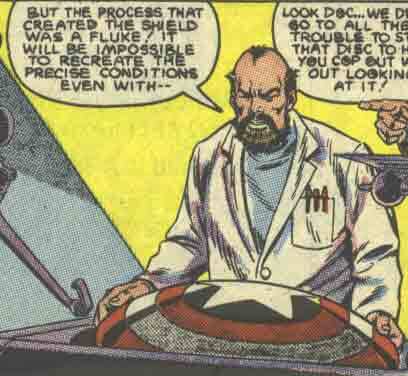 (Captain America I#303) - Dr. MacLain was captured by Mr. Arons of Stane International and forced to attempt to recreate the metal Captain America's shield was made out of. Arons obtained Cap's shield thanks to the help of Batroc's Brigade so that MacLain would be able to study it, and threatened the lives of MacLain's family to keep him in line. Arons demanded that MacLain design a suit of armor built from the shield's metal for the use of Obadiah Stane. (Captain America I#304) - As MacLain slaved to recreate the metal, he attempted to kill Arons by pouring molten metal on him, but Arons used Cap's shield to defend himself. They stripped the paint off of the shield in order to study it better, and created a number of duplicate shields in an attempt to find the secret. MacLain finally created the suit of armor Arons wanted, and Arons donned it when Captain America invaded the laboratory, looking for MacLain. It turned out that MacLain had not been able to recreate the metal, and Captain America smashed Arons' armor with his shield. Captain America and Nomad brought MacLain to safety, and promised to have S.H.I.E.L.D. investigate Obadiah Stane's involvement. (Avengers West Coast#89) - Dr. MacLain contacted the Avengers Compound to inform them that he had recently discovered a new means of creating Adamantium even faster than before. The Avengers promised to send some of their members to him for protection. By the time the Avengers arrived, Ultron had come and captured MacLain, leaving behind a robot duplicate of MacLain to deal with the Avengers. (Avengers West Coast#90) - Ultron captured Mockingbird and Dr. Henry Pym to assist a hypnotized MacLain in creating a new robot bride, using MacLain's Adamantium, Mockingbird's engrams, and Pym's robotics. The resulting creation was Alkhema. (Avengers West Coast#91) - When Ultron and Alkhema set out to take a nuclear missile, MacLain assisted Dr. Pym in designing an electromagnet for the warhead so that when the robots attempted to claim it, they were magnetically affixed to it, then seemingly destroyed when the missile detonated. (Secret Warriors#1) - MacLain was listed on SHIELD's agent files as stationed at the Tarantula Station, a suspected Hydra base. Comments: Created by Roy Thomas, Barry Windsor-Smith and Syd Shores. Obadiah Stane likely wanted MacLain to supply him with the shield's unique metal type for use in his Iron Monger armor. MacLain's appearance in Wolverine II#-1 acknowledged the long-standing continuity glitch surrounding the Adamantium in Wolverine's skeleton; how did Weapon X get a hold of adamantium before MacLain had even invented it? Wolverine II#-1 seems to suggest that Darkwind invented it independently, and that MacLain just happened to duplicate Darkwind's results and gave the metal a name (or possibly he received stolen data from Darkwind?). How old is MacLain? He had adult daughters in 1937 and is still alive today? Sliding timescale be damned. Maybe he received a blood transfusion or two from Nick Fury or he is secretly just an LMD these days with the memories of the original Myron MacLain. He wouldn't be the first.